Instagram Rolls Out Ability to Add Multiple Photos and Videos to One Post: Instagram announced that users can now “combine up to 10 photos and videos in one post and swipe through to see them all.” A new icon on the Instagram app allows users to select multiple photos and videos, which can then be reorganized, edited, or layered with a filter one by one or all at once. A row of blue dots at the bottom of these posts indicates to your followers that “there’s more to see.” This update is available as part of Instagram version 10.9 for iOS in the Apple App Store and for Android on Google Play. 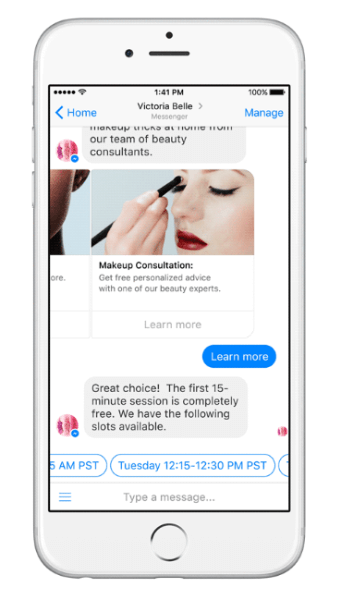 Facebook Messenger provides defined engagement models including time-based criteria for responses and standards for subscriptions. 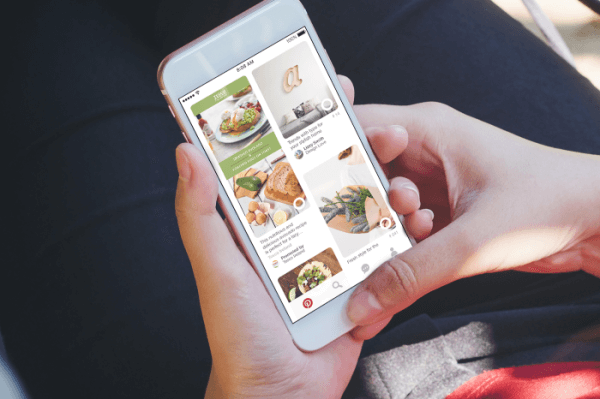 Pinterest announced continued international expansion of promoted pins into three new countries: Ireland, Australia, and New Zealand. 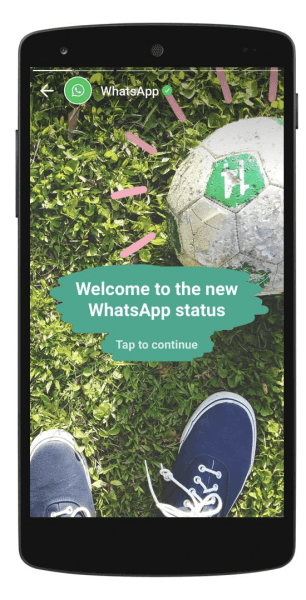 WhatsApp Updates Status Feature: Facebook-owned WhatsApp rolled out a “new and improved Status feature” that allows users “to share photos and videos with your friends and contacts on WhatsApp in an easy and secure way.” Like with any other WhatsApp messages, the status updates are “end-to-end encrypted.” TechCrunch reports that the new Status tab also removes all shared images, videos, or GIFs within 24 hours and “could also open up new advertising opportunities for WhatsApp… [by allowing] full-screen ads in-between friends’ Statuses” just like on Snapchat and Instagram Stories. WhatsApp is rolling out this new feature worldwide on iOS, Android, and Windows Phone. WhatsApp Status shares photos and videos in an easy and secure way. Facebook Rolls Out Three Updates to Video Monetization: Facebook shared three updates to video monetization on its site and through the Audience Network. Facebook announced that in-stream video is now available to “all eligible Audience Network publishers who have available inventory” on their own websites and apps. With this rollout, “publishers can bring relevant video ads to people all over the world, on both mobile and desktop.” Facebook is also expanding its beta test of Ad Breaks in Facebook Live and on-demand video to profiles and pages in the U.S. This means that a select group of creators testing this new experience can now take short breaks for ads during their live or existing videos and “earn a share of the resulting ad revenue” for it. In this week’s show from Friday, February 24, 2017, Michael Stelzner and guests discuss the top news in social media. 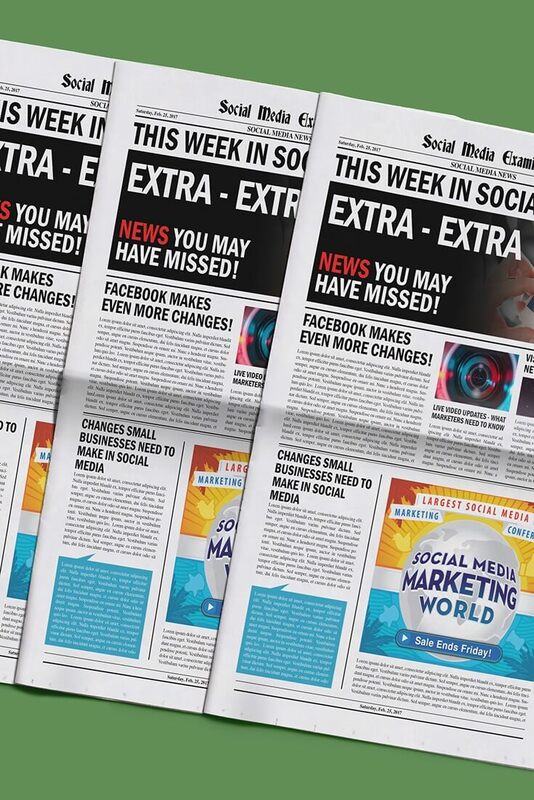 Topics include new multiple image and video posts on Instagram (7:33), updates to marketing policies on Facebook Messenger (27:08), and WhatsApp Status feature (39:28). Subscribe to future shows here. Twitter Releases Periscope Producer to All Users: After four months of testing, Twitter announced that its Periscope Producer service is now available to all users across mobile and the web. This tool allows “broadcasters to incorporate high-quality live video from sources other than their mobile device… into the normal Periscope live video experience.” VentureBeat reports that creators can now “share video from external cameras, an Xbox One, virtual reality headsets, a computer, a webcam, or other devices right into their broadcasts streaming through Twitter.” Periscope Producer is supported on the web and on iOS and Android. Crowdcast announced the official launch of the Crowdcast iOS app. Facebook Adds National Flags to Profile Frames: TechCrunch reports that “Facebook has added nearly 200 flags to its Profile Frames feature, which lets you overlay imagery filters atop your profile photo.” With this update, Facebook users now have a subtle and simple way to show support or demonstrate pride for an individual country. 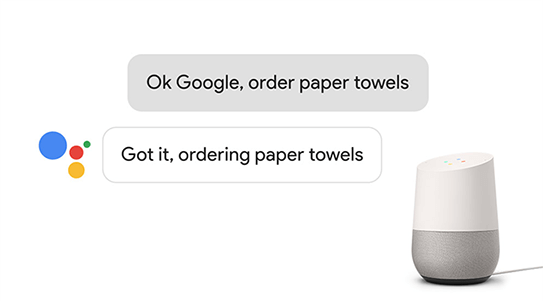 Google Home users can now shop from over fifty participating Google Express retailers with Google Assistant. Facebook Adds Two New Reporting Features to Analytics for Apps: Facebook rolled out “two new ways to help product managers, marketers, and developers more easily discover insights in Analytics for Apps.” The first of these new features offers developers a side-by-side comparison of customer segment data such as active users, revenue, and events. The second provides app developers with domain-level reporting, which offers insights into the websites that are driving people to a business. 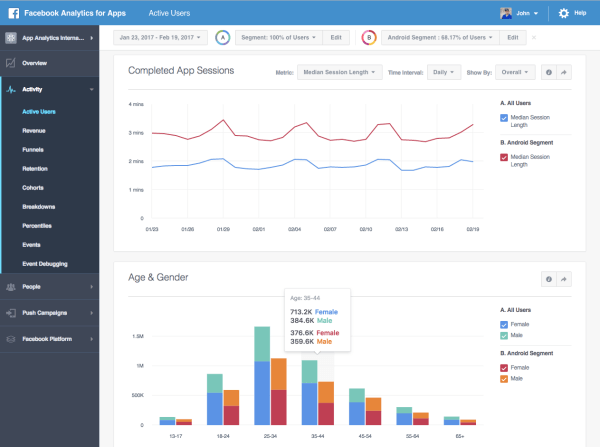 Developers using Facebook’s Analytics for Apps can now compare two customer segments side by side to see how active users, revenue, and events differ between them. Twitter Beta Tests Personalized Custom Profile in Direct Messages: Twitter is beta testing personalized custom profiles in Direct Messages, which allow businesses to make “private conversations more human and personal by showing the real face, name, and title of the care agent who is speaking.” The new custom profiles can also “more clearly indicate when a bot is speaking,” which will help manage [customers’] expectations about the types of replies they might receive” in Direct Messages. Businesses that are interested in testing custom profiles in Direct Messages on their accounts can submit a request online. Developers looking to build on this new API platform can apply for access here. Skype Announces Skype Lite for Low-connectivity Areas: Microsoft-owned Skype announced the upcoming launch of Skype Lite, “a retooled version of its voice and video calling service, designed for use in areas with limited connectivity on Android devices.” This new app only requires 13MB of space, supports nine regional languages and chatbots for connected services, and tracks mobile data usage. It also allows users to read and reply to SMS messages. Skype Lite will “soon be available” to download for free from the Google Play Store and will roll out to India first. Facebook Tests Shortcut Buttons to Other Social Media Platforms: Facebook is currently testing shortcut buttons to other social media accounts displayed prominently on users’ Facebook profiles. The Next Web reports that users have been able to add links to other social media accounts under the Contact Info portion of the About section. However, this limited test is “the first time said links have taken button form and been displayed so blatantly on your profile’s front page.” Facebook hasn’t provided any details about this test or shared any plans to roll it out more broadly. 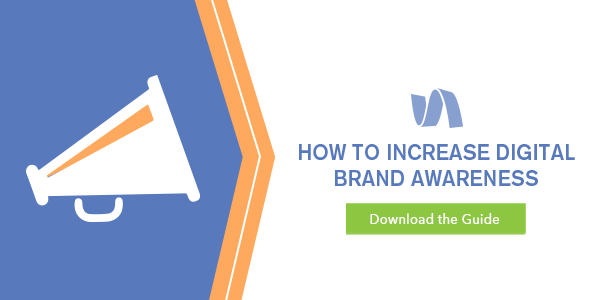 How to Increase Digital Brand Awareness: Are you looking for strategies to exceed your digital brand awareness goals? Do you want to learn what data to focus on to understand your web and social audience? If yes, download this guide to learn the steps you need to take to research and segment your audience(s) across social and the web, generate visibility by aligning your web strategy with social, and build the right content for your brand. Vocativ Facebook Instant Articles Test: Digital publisher Vocativ used data sourced from Facebook and Google Analytics to evaluate how well Facebook’s Instant Articles platform can deliver published content to a larger audience. Over a period of six weeks, Vocativ published 100% of its eligible content on the platform and found that referral traffic increased by 53% and returning visitors increased by 37%. The results also showed a 48% increase in comments and an 11% increase in average reach per post and shares. Snapchat Quarterly Report Q4 2016: Snaplytics analyzed over 500 brands posting more than 24,000 Snapchat stories consisting of more than 217,000 snaps to “establish a blueprint of how much is being posted [on Snapchat] and how often.” Along with case studies from major brands and influencers on Snapchat such as McDonald’s, Scary Mommy, and BBC One, this new report provides insights on how users find the brands on Snapchat, how often brands share snaps, and the open and completion rates for stories. The Current Content Ecosystem: A new white paper from CopyPress explores “the state of the content marketing industry” based on data from CopyPress’ State of Content Marketing survey and insights from 300 in-house marketers, agencies, and freelance creatives. The report breaks down content marketing from each of these three different perspectives and provides recommendations on where each should be putting their time, money, and content marketing efforts. Eight User-generated Content Trends We Learned From 25 Million Facebook Posts: A new report from micro-influencer marketing platform Mavrck examined more than 25 million Facebook posts from personal profiles throughout 2016 and found a 29.39% decrease in original posts per Facebook user. Although a shift in Facebook’s algorithm gave greater priority to personal posts and delivered a 26% increase in engagement per post over the course of the year, there was still a 15% decline in engagement per post in 2016 when compared to 2015. The findings also suggest user-generated content containing a brand garnered a 6.9 times higher response rate than brand-generated content and the more “influential users” earned a “significantly higher” average engagement per post. What do you think of the upcoming customer engagement updates on Facebook Messenger? Have you seen multiple images and videos in a single Instagram post? Please share your comments below. Instagram Multi-Image Posts and other social media news for Feb. 25, 2017.